Are you in the market for a new sewing machine? You have many options, but one of the top ones is the best Janome sewing machine. The Japanese company has nearly a century of experience in the industry and produces a wide range of home and commercial models. The company’s name means “snake’s eye” in Japanese and refers to the company’s round bobbin design used in the 1930s. This can be done by simply pressing a button, which makes the process faster and easier. You’ll want different lengths/widths for different projects. What’s this feature all about? It provides a working surface that’s narrower than standard sewing machines. There’s also a space under it, so it doesn’t hit the table the machine sits on. Typically, it’s more convenient to put the fabric you’re sewing on a wide base. The exception is fabric on tight tubes like sleeves/pants legs. In this case, it’s more convenient to place the tube around the free arm so the fabric isn’t bunched up and multiple fabric layers aren’t sewed on. This lets you sew easily without using Foot Control. This is a plus since it makes it easier to start/stop the sewing machine. When the sewing machine is easier to operate it thus makes your life easier since you can sew more efficiently and complete your tasks faster. That’s a good thing. This is a common feature on sewing ones but is definitely one to look for when picking a unit. There’s a mechanism under the sewing machine’s surface. When the needle is removed from the material sewn “feed dogs” are pushed through an area located in the surface of the machine. They’re then dragged beyond the needle horizontally. This is a technical issue but one that’s worth noting. The other main option is push/pull bobbin winding. This involves pushing the bobbin to the side, then pressing the foot control pedal so the thread winds onto the bobbin. Then you push the bobbin back in place. As the name suggests auto -clutch bobbin winders involve the machine stopping the needle automatically, so it doesn’t go up/down when you wind thread onto the sewing machine’s bobbin. You can easily make stitch selections using the 2-digit LED Screen. This is critical so you can pick a particular stitch for the work you’re doing. In fact, this unit has 30 built-in stitches to provide more versatility for different tasks. The LED screen makes it easy to view and change the stitch you’re currently using. This is a plus so you can easily monitor and adjust the stitch you’re using for your work. The unit’s Teeth Box Feeding System makes sure feeding is as efficient as possible. That’s the case whether you work with light or heavy fabric. This makes it easy to see whether or not you’re running out of the thread. That makes it easier to swap out the unit before starting a new sewing task so you’ll have enough thread to work with. This helps to reduce downtime when you’re in the middle of a sewing project. This function is easy on the 8077 and is another feature worth noting. It involves pressing a button, so you begin sewing in a backwards direction. Typically, you have to release the button to start sewing forward again. You can find tons of sewing machines with a reverse sewing feature. However, you should definitely look for ones that make the process as easy as possible. This Janome unit does that. It’s a plus when the process is as easy as possible to prevent possible logistical issues when sewing. This allows you to set the tension then it stays in place. This makes your sewing easier and more hassle-free. It’s one less thing you’ll have to worry about when operating your sewing machine. Threading a needle before sewing can be one of the most meticulous tasks you have to complete. Luckily the 8077 includes an Automatic Needle Threader. This makes the process easier and prevents issues like eye strain. You just put the thread in a hook located in front of the needle. Then pull the lever back, and the needle is automatically threaded. The process is done quickly and easily so you can get started with the sewing. The time and energy you save can be used for your sewing projects. This provides you with just about everything you need to get started using this sewing machine. It also helps you save a small fortune you’d typically have to spend to buy these items separately. This makes the unit perfect for using at home or when you’re away from home. It’s even portable enough that you can do some basic sewing when you’re on the go. Most sewing machines don’t have this feature sos you’ll have to install the unit at a stationary location like at home, for example. In fact, Graceful Grey only weighs 5 pounds. This is quite low for a sewing machine and adds to the unit’s portability. It makes the unit practical for various applications including at apartment, dorm, class, or sewing sessions with friends. The Graceful Grey includes 11 built-in stitches. This includes straight, crescent, zigzag, and 2 needle positions. This figure is much lower than several other units on the market. However, it’s enough for basic sewing and sewing newbies. Many sewing machines have a reverse feature, but it’s a plus when the process is easy. This makes it easier to toggle between sewing in a forward and backward direction. As a result, your sewing will be more versatile, which is a plus. This might seem like it’s a hands-free feature provided by Graceful Grey, but that’s not quite the situation. On free arm sewing machines, the area beneath the needle is extended so the sewer can work with the fabric more easily. Free arms are found on portable units. To put it another way that includes units that aren’t encased in a cabinet. Keep in mind not all portable sewing machines have this feature. However, many sewers prefer this feature and especially when working with small items like collars/cuffs. It doesn’t provide a benefit when you sew fabric that’s long/straight. This makes it easier to observe how much thread is left on the bobbin. You can thus swap out the unit before starting big projects that require more thread. This is a big plus in terms of making your sewing more efficient and helps to reduce downtime. This feature makes your sewing more efficient and organized. These factors are always important but especially important if you’re new to sewing. It will help to experience a steep learning curve. Here’s another plus when you’re starting out with sewing. It’s important to have guides to make your work easier, and this is one of the top features to achieve that goal. Here’s another feature that’s a plus for new sewers and basic projects. It makes the setup easier so you can start your sewing project faster. The HD1000 includes 14 built-in stitches like Simple, Stretch, and Utility. This makes the unit a practical option for different materials and applications. The HD1000 is made of cast aluminium. This material is tougher to find today but was one of the top choices in the past. This helps to extend the lifespan of the unit. You just have to turn dials in order to tweak the switch to the right settings for the stitch type you want to use. These are all features that provide a better experience for sewers. They also prevent the need to purchase the items separately, which can add up quickly. You might need all the accessories, but you’ll have them if you do. This makes needle-threading faster and easier. You also won’t experience eye strain, which is something you’ll want to avoid. In fact, threading a needle whether it’s for manual or machine sewing can be difficult. The unit is bundled with a hard-sided cover. This helps to protect your sewing machine when it’s not being used. This provides free-motion sewing. You just lower the dog feed to experience free-motion sewing/quilting. The drop feed feature can also be used when darning/stitching buttonholes. This can be used for sewing things like cuffs, collars, and pants. This feature is preferred by many sewers. Keep in mind it doesn’t provide any benefits when sewing long/straight fabric. Another plus of this feature is it makes storage easier if you don’t have a sewing room. You just snap the cover and put it in a convenient corner/closet. The system is 3-piece and provides smooth fabric feed regardless of the type of fabric you’re using. It’s especially helpful for quilting and high-pile fabrics. Why a Janome Sewing Machine? Some Janome models have stitching speeds over 1,200 stitches per minute (SPM). This makes it easier to complete your stitching tasks, which is always a plus when doing work on sewing machines. This makes your work easier since you can do different types of stitching for different projects and materials. This feature is a plus when doing quilting work since the quilt’s materials won’t get stuck under the needle. That’s because it provides the sewer with a better view of the material they’re sewing and particularly for decorative topstitching. It provides markings on the foot’s front edge that matches up for outstanding stitch alignment. Janome produces several sewing machine models that are designed to meet the needs of household sewers. This is a plus if you’re looking for a sewing machine that’s designed for home rather than industrial use. The sergers from Janome make it a good option to give your projects a more professional look. That’s via seams that don’t ravel/overlock. You can use a 4-thread serger with 2/3/4 configuration. It allows you to complete different sewing jobs in style. One of the big benefits of Janome sewing machines is they offer the benefits of other brands at a much lower price. This benefits households on a shoestring budget in particular. However, it’s a plus for newbie and guru sewers when they can save some money on their investment. Janome sewing machines are a piece of cake to use. After reading the instructions, all you have to do is thread the sewing machine. Many of the company’s units are good options for newbies. 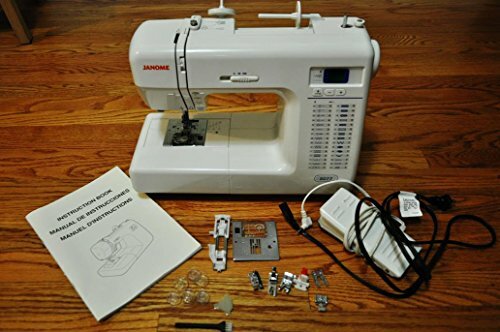 Janome models are often referred to as “toy” sewing machines. This isn’t an accurate description because the units are ideal for basic sewing. However, Janome machines can be effective for teaching kids how to sew. Today many sewing machines are made cheaply and are thus also shoddy. A big plus of Janome is its dedication to producing quality units. This helps to boost the units’ functionality and durability, which are both critical when buying a new sewing machine. 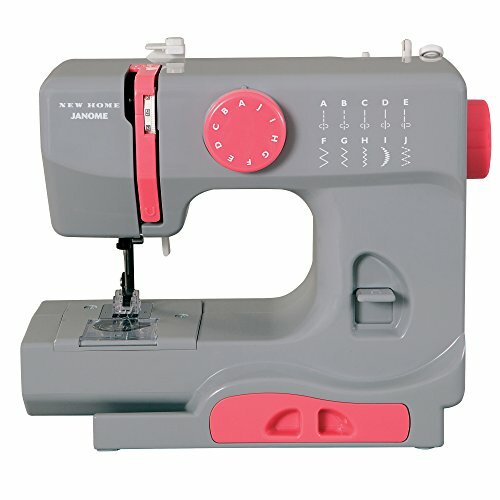 A related benefit of Janome sewing machines is the units have good durability. They can often last for many years even with heavy-duty sewing. This helps to prevent issues like parts replacement including broken needles. Janome models don’t tend to have a lot of bells and whistles. However, that’s ok when you have to complete some basic sewing jobs. In that situation, you don’t really need tons of perks to get the job done. In that case, Janome sewing machines are a good option. 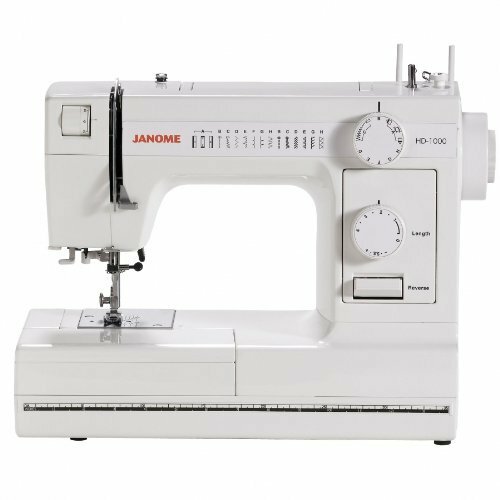 If you’re looking for a durable and reliable sewing machine for basic/beginner sewing, then you should consider units from Janome. The company has almost a century of experience in the industry. Some of Janome’s models are even good for teaching kids how to sew.